1 pound of the meatiest lamb breast you can find. Preheat the oven to 300°F. In a large Ziploc bag, shake together the pepper, cinnamon, nutmeg, garlic powder, and clove. Add the ribs to the bag, and shake to coat. Marinate in the fridge for 6-8 hours or overnight. In a small pot, heat 3 tablespoons honey with the vinegar and oil, until the consistency is runny. Line a baking pan well with foil. In a large bowl, toss the ribs with salt, sliced onion, and the honey mixture. Arrange the ribs in a single layer on the baking sheet, and cover tightly with foil. Bake for 2 hours, turning twice during cooking. After 2 hours, take off the foil, and bake an additional 30 minutes until nice and browned. Heat the remaining 2 tablespoons honey in a small pot until runny. 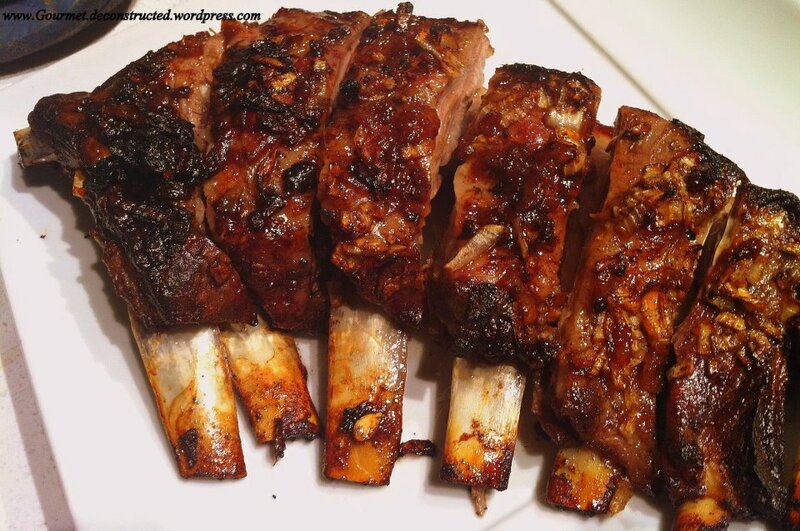 Brush the finished ribs with the hot honey, and serve. Bon Appetit! Posted on October 17, 2012, in Lamb and tagged honey roasted, Lamb breast, lamb ribs. Bookmark the permalink. 11 Comments. This looks absolutely my style delicious! Have to look up my few recipes and see whether there is a difference 🙂 ! Perhaps the addition of cinnamon and cloves [am just learning about Burmese/Myanmar meat cooking: oh boy, are those two used a lot there!!]. And, oops, don’t use garlic powder; always the real McCoy, but this looks lovely!! Thank you Eha & Donna! You know what? I might actually eat lamb if prepared this way! Could I do this seasoning on a leg and have it come out okay? I’ve been wanting Lamb. Almost bought lamb chops and lamb loin chops, but thinking more of a stew, but this looks good … maybe try this one. I’ve cooked lamb chops and leg of lamb, but never lamb breast. I got a lamb breast in my local farm meat package this go around. I found your recipe! This sounds delicious! It’s going in the oven right now! Thank you for sharing this. I can’t wait until dinner. Thank you so much for posting this recipe, it was such a hit at my mom’s house last night. I was hesitant to try it as I had never even had ribs or cooked lamb before, but I made this yesterday and got rave reviews from my family. It was very flavorful, and the meat was so soft it just fell off the bone. – I used garlic paste instead of powder and added just enough water to the spices to make it more like a marinade than a rub. – Next time, I will cut back to perhaps 1.5 teaspoons of clove. – I wasn’t sure if I was supposed to roast it with the onions, and didn’t really have a bowl big enough to “toss” the ribs with the onion and honey, so I just mixed up the onion into the honey, added whatever leftover marinade that was in the ziplock bag, and put half on the bottom of the pan, and poured the other half over the ribs. – I started with the flat side of the rack on top. I don’t know if this makes a difference. – Next time, I will add either prunes or dates along with the onion. We ate the lamb with dates and they went together perfectly. – I forgot to add oil and didn’t miss it. – I forgot to add the salt and didn’t miss it, didn’t even realize until I was writing this up. – I turned the rack every forty minutes, and re-covered the rack with the onions on the bottom that had soaked up the marinade. – When I removed to top sheet of aluminum foil for the final thirty minutes, I turned the lamb and coated it with half the remaining honey, and cooked it for twenty minutes. I then turned it, coated it with the other half of the honey, and cooked it for another ten. – Once finished, at the bottom of the baking pan, there was a lot of what we call shorba in Urdu, I don’t know the English word … meat juice? Drippings? In any case, you could definitely mop that up with some saffron rice or barbari. Sounds great! My hubby LOVES Lamb loin chops bit can’t find them often. I picked up breast riblets, presliced, from my local grocery store today. My question is, they look small to cook for 2 +hours. Might they need less or does the lower oven temp make the difference? Thanks!!! !